Invented for all musicians. 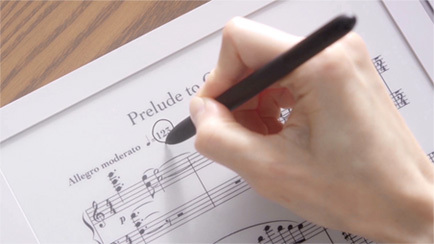 GVIDO, a dedicated dual-screened electric paper music score device. Using large dual electronic paper screens, the appropriate visibility and usability for performance can come together! Able to input PDF formatted music scores. ●You can add your electric musical scores purchased from GVIDO Store via GVIDO Services (connected to wireless LAN) ●You can load your personal electric musical scores using either a USB cable or GVIDO Services. 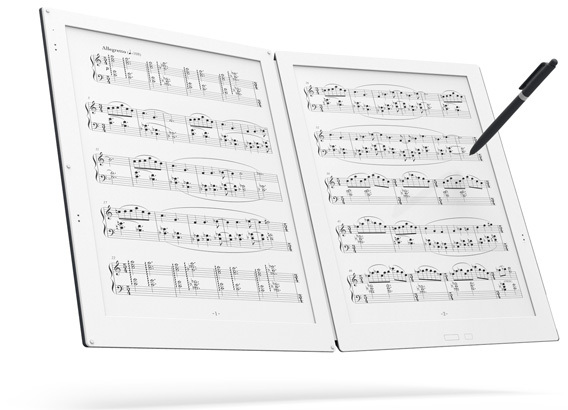 You can turn the pages by using a touch switch on GVIDO Digital Music Score Device. There are three touch switches and you can change the page turn directions. ●Customizing page settings- you can set up page repetitions or skip pages. ●Read ahead to the next page - you can display the next page ahead of time. ★Exceptionally outside visibility and avoid pages flipping with the wind. You can either write in or delete comments on either screen using the included stylus pen. ●You can save up to 100 layers of comment. You can share them via GVIDO My Library services. ●You can change the diameter and color density of the pen input. ●Flipping the pen around, you can erase directly without changing a menu option. You can store 4,000 music scores in the internal memory. ●You can increase the storage with a microSD card. GVIDO Services include the My Library and GVIDO Store. You can save/manage musical notes, memos or bookmark. Also, sharing* memos among registered members is possible. *Some paid services may be included. We provide an e-paper musical score device, optimized electric musical scores, and accessories. Your music scores will be stored in GVIDO My Library. ★GVIDO Services will continue to add more options and various genres of musical scores for purchase. After three hours of charging you can use GVIOD for three days*. As a result of combining flexible electronic paper, carbon fiber and a flat hinge, GVIDO is only 6 mm thick and weighs in at 660 gm. It's not only lightweight but highly durable. Adding the optional leather cover, the total weight is approximately 1 kg. *Flipping 100 pages per minute per day. 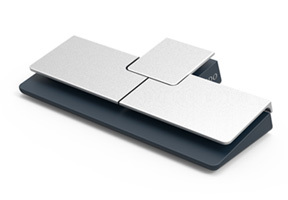 GVIDO foot switch can flip the pages via a USB cable or Bluetooth connection. You can call the set lists using the switch function. The foot switch is made from aluminum for lightweight durability. 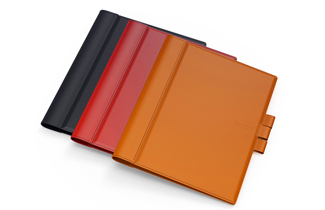 Genuine Leather Case is handmade and carefully crafted using high quality leather. It protects not only GVIDO Digital Music Score Device itself but also protects against damage to musical instruments.